The 1970 Ford Mustang BOSS 302 serves several purposes… with the first being to make the Mustang legal for competition in the red-hot SCCA Trans AM road race series The other purpose of the BOSS 302 was purely to provide us wannabe racers with an at-home-player version of the Trans AM racer that was ready to rock right off the showroom floor. These cars featured all the style of the track-only cars, but were 100% street legal. And they weren’t just for looks, either… the BOSS 302 has a long list of performance improvements over the base model Mustangs. From The Brothers Collection. The original GT350 hit the streets… and tracks… in 1965 and is still regarded as one of the most capable American performance cars ever built. The ‘65 was a no-nonsense purpose built street legal racer in a Mustang 2+2 body comprised of hand-picked parts and smart modifications made by the Shelby team in Venice, CA. It was light, nimble, and basic, and it rocked on the street or track. The Shelby name has since been applied to just about everything you can think of, and there is no doubt that some Shelbys remained more true to the original concept than others, but the 2016 GT350 is one hundred percent deserving of the snake and stripes. From The Brothers Collection. Welcome to the 200th episode of Muscle Car Of The Week! For this special presentation, we’re sharing an exclusive interview with 3-time Indy 500 winner Bobby Unser recorded at the 2016 Muscle Car and Corvette Nationals (MCACN) in Chicago featuring the amazing 1969 Ford Torino Pike’s Peak racer he drove to victory in 1969. The legendary cast of characters in the story includes Bunkie Knudsen, Smokey Yunick, Bill Stroppe, Holman & Moody, and many others, and Unser tells the fascinating story as if it happened yesterday. The car is a purpose-built stock car built by Bill Stroppe and Holman & Moody and is powered by a Smokey Yunick built Boss 429. Unser had not seen the car since ‘69, but he was surprised to learn that the car remains in as-raced condition today. He went on to share many stories of racing in general, and how to be a winner not only on the track but also in life, and a great recollection of a huge party after a winning snowmobile racing season! The display was a huge hit at the Muscle Car and Corvette Nationals, and the car is a very special piece of racing history in the Brothers Collection. Enjoy the show, and thanks for watching Muscle Car Of The Week! 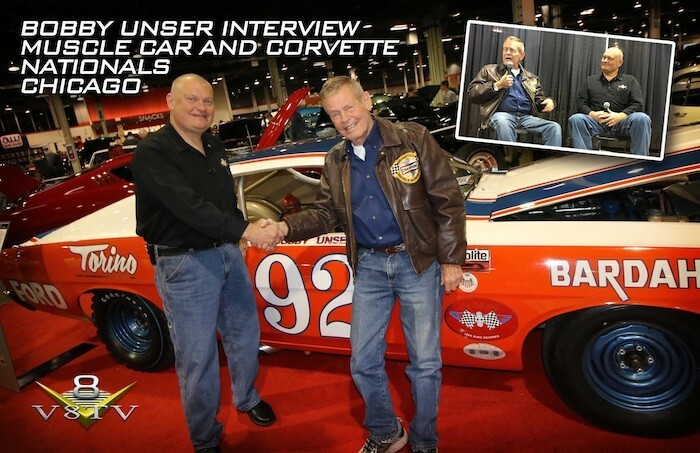 BONUS PODCAST: The 1 hour stage interview of Bobby Unser from the Muscle Car and Corvette Nationals! Clik the PLAY button to listen!